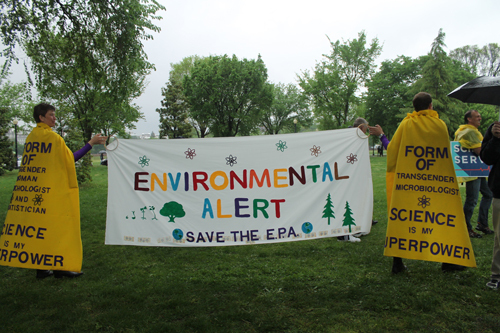 Science enthusiasts descended on the National Mall in Washington, D. C., and demonstrated in more than 600 cities and other places globally in support of science and evidence-based decision-making. Nina Liakos hopes to be a geologist in her next life. Liakos, a retired teacher of English as a second language, expressed her next-life goals while walking along Constitution Avenue NW on a chilly, wet Saturday in Washington, D. C., surrounded by a column of marchers chanting in the name of science. 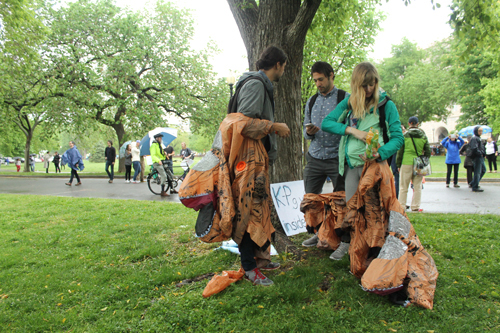 She was one of thousands of teachers, students, scientists, and science enthusiasts on the National Mall on Earth Day, 22 April, at a demonstration for science and fact-based policy, called the March for Science. The march erupted from frustrations about stances of the new administration that critics say are “antiscience.” President Donald Trump has called climate change a hoax created by the Chinese. He also has proposed a fiscal year 2018 budget that severely slashes funding for the Environmental Protection Agency, NASA Earth science, the National Institutes of Health, the National Oceanic and Atmospheric Administration, and other federal science agencies. Scientists and environmentalists have also voiced concern about Trump’s rolling back environmental policies initiated under former president Barack Obama, approving the Keystone XL pipeline, and even discouraging government scientists from speaking with the media and public. Many scientists are concerned that decades of valuable environmental data will disappear, prompting a wave of data rescue events across the country. Some people equate Trump to Canada’s former prime minister Steven Harper, whose government destroyed environmental data. Harper’s muzzling of government scientists also prompted Canadian scientists to march in 2012 in a “Death of Evidence” march. The March for Science was inspired by the massive Women’s March in Washington, D. C., on 21 January that drew more than 500,000 people in protest of Trump’s history of sexist comments and the administration’s promises to roll back civil and reproductive rights protections. In the wake of that march, a small group of scientists started kicking around the idea about a scientists’ march. The effort quickly grew online and then attracted the attention of several large scientific institutions like the American Association for the Advancement of Science, the American Geophysical Union (which publishes Eos.org), and The Planetary Society. Those and more than 150 other organizations signed on as partners. They teamed up with the Earth Day Network, which has organized annual Earth Day celebrations since the 1970s, to devote this year’s Earth Day to promoting and defending science. A 4-hour rally starting at 10 a.m. kicked off Saturday’s premiere March for Science event, the Washington, D. C., march, which shared the day with hundreds of satellite marches and rallies around the world. 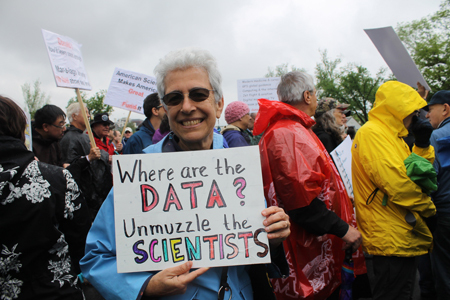 Attendees of the D. C. rally milled around in the rain and mud, huddled under trees, and packed themselves into tents where scientists gave 15-minute lectures about their research, covering topics from ocean conservation to bee biology. Meanwhile, speakers of a wide range of ages and backgrounds, including children, took to a stage to pump up the drenched crowd. Other speakers included Bill Nye of the “Science Guy” fame, who is now CEO of The Planetary Society; retired astronomer Nancy Roman, who was chief of NASA’s Astronomy and Relativity Programs and the first woman to hold an executive position at NASA; Michael Mann, a climate scientist at Pennsylvania State University in University Park; the musician Questlove; Mona Hanna-Attisha, a pediatrician who first brought awareness to the high levels of lead in the drinking water of Flint, Mich.; Lydia Villa-Komaroff from the Society for the Advancement of Chicanos/Hispanics and Native Americans in Science; and many more. During the organizing of the march, internal debates had raged about how focused the march should be on diversity. Some critics attacked march organizers for focusing too heavily on issues of diversity, others for not enough. Some of the original organizers dropped out, claiming that diversity issues were being ignored. “Science has historically been dominated by white males, and that has led to the oppression of many people,” ecologist Theresa Ong told Eos at the rally. She and some fellow marchers, displaying a “Decolonize Science” banner, represented Science for the People, a group that advocates for science to fulfill social needs rather than corporate or war-driven ones. “Science supports the lives of trans people, and we need to also support transgender scientists,” Andrea Zekis, who marched representing the National Center for Transgender Equality, told Eos. Not everyone liked hearing and seeing political views at a science rally. “My sense is that people are [at the march] mostly because they dislike Trump” rather than in support of science, Hess said. Signs held messages like “Science, not silence,” “Make America smart again,” “The seas are rising and so are we,” and “Polar bears are on thin ice.” Some marchers sported lab coats or dressed like famous fictional scientists like The Doctor from the British television show Doctor Who or the cantankerous Rick from the American television show Rick and Morty. There were at least three people in Tyrannosaurus rex costumes, warning onlookers that a fate similar to the dinosaurs’ extinction could await humans and many other lifeforms on Earth from unchecked climate change. “Science is the future, science is the present, science is going into space and saving organisms,” said Bec, a teenage marcher sporting lab goggles. She hopes to someday study entomology. “I am marching in support of science because science” explains the things that make up our world, she said. Science enthusiasts marched in more than 600 locations globally on Saturday, according to March for Science organizers. In addition to the main march in Washington, D. C., U.S. satellite events occurred in cities like New York, Chicago, Seattle, San Francisco, Los Angeles, and many others, while in other countries, sister marches advocated for science in Paris, London, Vienna, and Berlin, to name just a few places. There were even marches at the North Pole and under water. In Charleston, S.C., chanting crowds converged from three directions on the city’s Liberty Square, where marchers listened to Charleston mayor John Tecklenburg and City Council member Michael Seekings talk about the threat of climate change. “Sea level rise is a reality here in coastal South Carolina and around the world,” Tecklenburg told Eos, stating that the city expects to see an estimated 60 centimeters (2 feet) of sea level rise in the next 35 years. “The need for preparedness in this community is urgent,” he added. “The only place on Earth that I think is denying climate change and sea level rise is 1600 Pennsylvania Avenue,” Seekings told Eos. 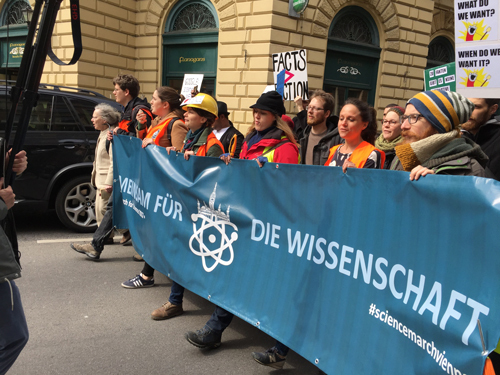 At a satellite march in Vienna, Austria, where the annual meeting of the European Geosciences Union was about to begin, former geologist Birgit Kühnast said she was marching “because I notice more and more that people think science is just an opinion, a belief. I don’t like to tell people that I know better than they, because I am a scientist. But scientists should tell people more often, in a neutral way, what good they are doing” in the world. Citation: Wendel, J., R. Showstack, P. L. Weiss, and B. den Hond (2017), Thousands march worldwide in support of science, Eos, 98, https://doi.org/10.1029/2017EO072439. Published on 24 April 2017.